What does God see in this "garden of ministers?" Two great preachers discuss the importance of preaching, preparation for preaching, and making an appeal at the end of the sermon. What is it? And how does it apply to church life and, more importantly, church growth? Lessons from the life and ministry of Moses, particularly applicable to pastors today. A "must read" primer in leadership and administration, especially for pastors who are starting ministry. Pastors, like athletes, occasionally find themselves in a rut. Here are some suggestions to get out of that rut and recover a vibrant ministry. Since "prayer brings balance," as this author states, the end of 2006 is a good time for personal assessment. 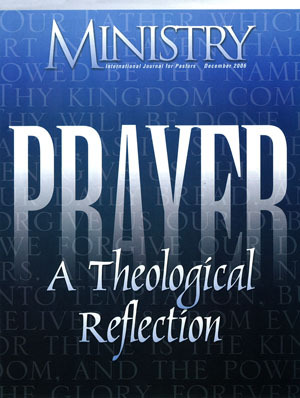 What does prayer teach me about God? About myself? What do my prayers reveal to the watching universe?